SEPTEMBER 24 – OCTOBER 1, 2019. We will visit Galway on the Wild Atlantic Coast and the Cliffs of Moher if you wish, Belfast Northern Ireland and the incredible TITANIC EXHIBITION, have a typical Irish dinner and attend an Irish musical performance, explore Trinity College to see the Book of Kells and marvel at the original St Patrick’s Cathedral. Airport transfers, first class hotel, breakfast, private bath, private guide and transportation/entrances to all planned sights are included. This is a LEISURE TOUR from ONE hotel. Unpack only once and ENJOY! Includes airport transfers at the destination, superior hotels with private bath in a central location, breakfast and dinner* daily, ETCS Travel Preparation and Sightseeing Documents, and myself as guide/translator. MAXIMUM NUMBER OF TRAVELERS IS ONLY 8-12 . Sept 25 Arrive in Dublin, capital of Ireland. Transfer to the hotel. Afternoon at leisure. If you wish, join me on a stroll down O’Connell Street. We’ll visit the historic Post Office where the Uprising of 1916 ended and see the 600 foot tall Millennium Spire, the new symbol of the city. 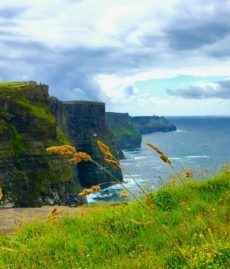 Sept 26 Choose to travel by guided coach to the Cliffs of Moher and the Burren on the West Coast, or travel by train with me to GALWAY, a charming seaside university town with lovely shops and cafes. 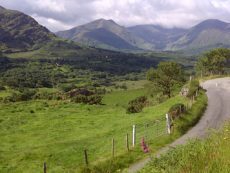 This wind swept countryside has inspired writers and painters for centuries. Later we all return to Dublin. Sept 27 We begin the day at Trinity College to view the Book of Kells, the illuminated copy of the Bible from the 9th century. This is the most magnificent piece of Dark Ages art remaining in the world. The craftsmanship and intricate designs are still impressive today. 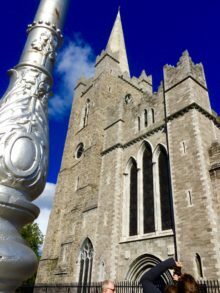 Through downtown Dublin we will stroll over to St Patrick’s Cathedral, along the Liffey River and across the Ha’Penny Bridge. Sept 28 We take the train today out to the nearby seaside village of HOWTH to enjoy the upscale fishing village and perhaps some seafood chowder. Later we’ll take the ferry up the East Coast to the town of Dun Laoghaire and return to Dublin by train. A wonderful day on land and on sea. Sept 29 Via train north to Belfast Northern Ireland today, birthplace of the Titanic. We visit the TITANIC EXHIBITION, newly opened, which is stupendous in its recreation of the great ship and of the disaster in 1912. We will visit the famous Belfast City Hall, see the town’s memorials to the ship building industry and enjoy some English tea and scones. Later we return to Dublin by train. Sept 30 North by train to another of the beautiful postcard perfect villages nearby, to DALKEY. 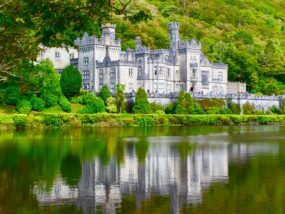 We will have time to explore the history and culture of this village and shop for lace and other local specialties, before we return to Dublin. Tonight join me at a farewell Irish Dinner and Show for a grand send off for our final night. Oct 1 Transfer to the airport for the return flight or continue to sunny and lively GREECE!. 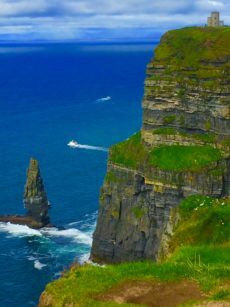 *Passengers who choose the coach tour to the Cliffs of Moher and the Burren will miss tonight’s dinner. Prices are PER PERSON sharing a room and based upon current exchange rates / costs and do not include airfare or taxes. Late deposit $3199, Early deposit $2899, MRT Returnees $2599. Single supplement $349. PAYMENTS: $1500 p/p deposit with REGISTRATION FORM on website. Make check payable to ETCS, Inc., 922 Oak Grover Road, Jackson MI 49203. Balance due 90 days prior to departure. See TERMS & CONDITIONS on the web site. Call Mike at 517-782-6847, send an e-mail to Mike@mikerosstravel.com or visit us on the web at www.mikerosstravel.com.